Pelage: Short, sleek hair. Background color varies from grayish to buff to cinnamon. Chains of black-bordered spots running along shoulders and back. Tail ringed with black or with black bars on top. Range: Mexico, Central America, to NE Argentina, southern Brazil and Uruguay. A small population (fewer than 100 estimated) in southern Arizona and South Texas. Locomotion: Slow steady walk when hunting - 0.3 km/hr (0.2 mph); powerful climbers and adept swimmers. Activity Cycle: Mainly a nocturnal predator but sometimes hunt in day (if prey sought is active in day). Social Groups: Mainly solitary but independent young may associate with parents. Males and females may associate even when not breeding. Diet: Highly adaptable generalist predator; consume small and medium-sized prey as available. Predators: Puma, jaguar, harpy eagle, anaconda, and boa constrictor. Sexual Maturity: Females can reproduce at 18-22 months; males produce sperm at 2.5 years. Age at Weaning: May continue to nurse for 6 months; take solid food at 8 weeks. Longevity: 7-10 years in managed care; up to 20 years in wild. commercial trade in skins was banned; fewer than 100 ocelots remain in the wild in the U.S.
for these cats that are endangered in the United States. © 2011-2019 San Diego Zoo Global. Minor updates in April 2015. Taxonomy updated Mar 2019. Population estimates updated Apr 2019. 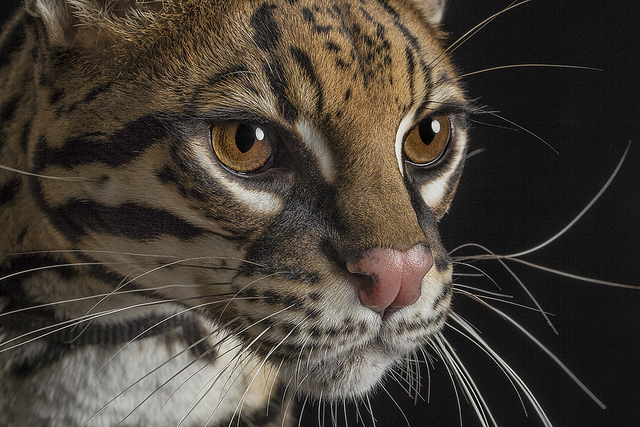 How to cite: Ocelot (Leopardus pardalis) Fact Sheet. c2011-2019. San Diego (CA): San Diego Zoo Global; [accessed YYYY Mmm dd]. http://ielc.libguides.com/sdzg/factsheets/ocelot.